On the weekend I caved in and bought a couple new books. (I said I wouldn't, I don't have money, have reports to write, yadda yadda yadda). Anyhow, I went straight to the balcony of a cafe and started reading it. And didn't stop. 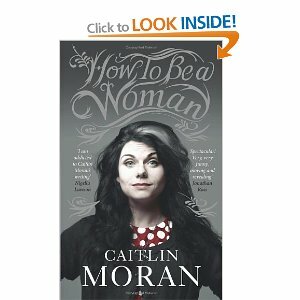 I read this book not long after reading Tina Fey's book. Quite similar in style, Caitlin often putting herself down for the sake of humour. But there are less 'in' jokes in this book, even men don't have to be 'in' the women camp to find it funny, plus it is British- therefore funnier (to me...). I seriously laughed out loud at parts. A favourite being when she was talking about a woman's choice to have a baby and her experience as a young mum, juggling life as a journalists with being a parent. Sounds like a fun read!! Thanks for sharing! That sounds so good! Thanks for sharing, I'll read it! Yay! This is totally up my alley! British humour + feminism = love. Thanks for sharing, I'm legit putting this on my list (it may even bud up a few spots). Haha! Funny is good. British humour is great. And yes, feminism isn't about hating men, although I suppose some of them do. Just like some of those who aren't probably do too. Oftentimes I'll overlook weaknesses from a writer if it's funny. I love a good laugh!